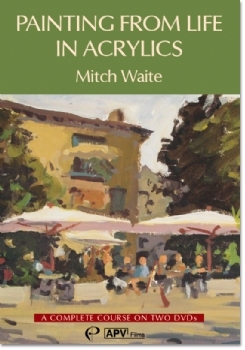 Mitch Waite runs an extremely successful art school near Nice in the south of France. 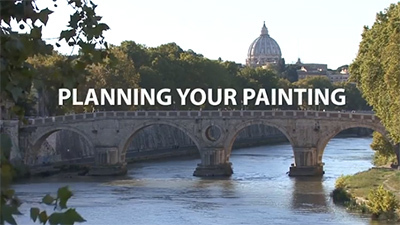 For this film he has devised a complete course covering all areas of painting in acrylics. 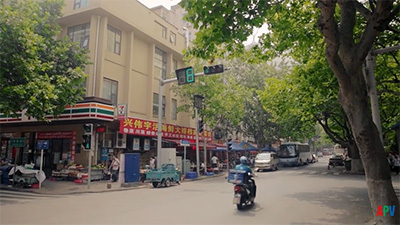 We follow him as he works both in his art school and in the surrounding village streets, harbours and rural countryside. 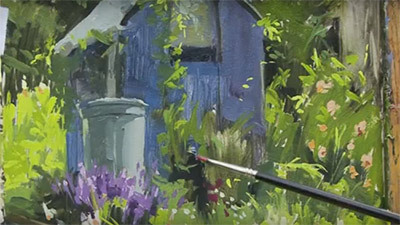 In part one he guides us through perspective, composition, tonal studies and colour mixing and in part two he paints a variety of subjects to demonstrate the lessons from part one. 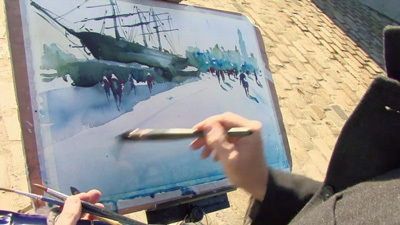 Mitch Waite is another excellent tutor and in his new film, Painting from Life in Acrylics he guides the viewer through all the key techniques and considerations necessary for making a confident start in acrylic painting. 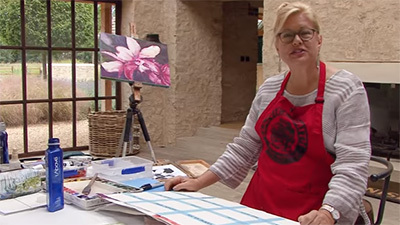 Mitch runs the Maison des Arts painting school near Nice, and this is where we first meet him in Part 1 of the course as he works in charcoal and demonstrates the essentials of composition, tonal values and perspective. 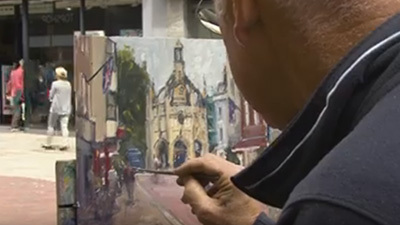 Next, painting a village street scene, he shows how to assess tonal values and warm/cool relationships to create a sound basis for acrylic paintings. Part 2 focuses on painting from life and putting the theory into practice. 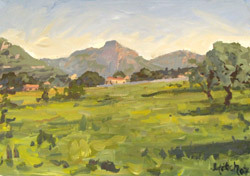 There are five demonstration paintings, all worked on location, including a portrait. This is a lively and encouraging course in acrylics; thoroughly recommended. 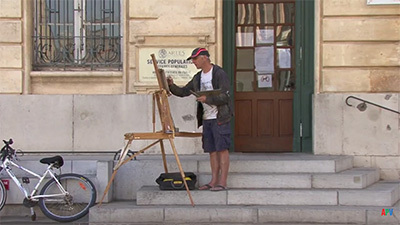 Mitch Waite, who runs his own art school in the Nice area of the South of France, is a talented artist as well as a successful teacher. He has now produced a complete course covering all aspects of painting in acrylics. All this packed into two DVDs, lasting 3 hours. Part 1: He begins with composition and demonstrates his approach with bold charcoal sketches of an old abbey viewed from the garden of his art school. He develops the best of these into a full size charcoal study. Tone comes next and he illustrates this with bold charcoal shading. He deals briefly with simple perspective and draws a village street by way of illustration. The theory of colour is treated in greater depth, starting with the colour wheel and primary colours through to accurate colour mixing. Part 2: The lessons learnt in Part 1 are put into practice in the second DVD in which Mitch paints a variety of Proven�al subjects. 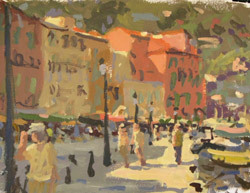 These include a sunlit street glowing with colour, Villefranche harbour port, a landscape featuring distant mountains, a hilltop village, a caf� fronted with a group of parasols and finally a portrait. Mitch uses acrylic paper clipped to his easel-mounted board and a mixing palette with tear-off sheets to cope with the quick drying paints. He works quickly with bristle brushes and his bold approach together with his feeling for tone and colour produced powerful and satisfying images of his subjects. This course will be of interest to all aspiring acrylic painters and particularly those who are striving to loosen up.